On this page I've expanded on my professional qualifications, including reflections on how my experience shapes my work as a coach. Harvard Graduate School of Education. Earned Masters of Education with a focus on learning and teaching and coursework in how adults transition through stages in life. Studied under Robert Kegan, author of The Evolving Self; Change Leadership; In Over Our Heads; How the Way We Talk Can Change the Way We Work; and Immunity to Change. Kegan's work, in particular, has provided me with a framework for understanding developmental stages and for teasing out what it looks like to move from one stage to another. These transitions are messy, painful, and they feel like a death before they feel like a birth. My work at Harvard has also helped me to see how to provide supports for this process of growth and transformation. Public Consulting Group, Inc. Led and managed a division of 30, quadrupling revenue over five years. Integrated an acquired firm, developed consulting services for PCG's international practice, and designed and delivered professional development workshops in the U.S. and internationally. Supervised, coached, and mentored, both formally and informally. My work with Public Consulting Group has given me a profound understanding and respect for both the challenges and the rewards of the high-pressure business world. It was in this environment that I learned the importance of unlocking the creativity of the individual and the group, creating a culture of participation and engagement, and taking care of the self in the midst of multiple, competing demands on my time and energy. Transformational Workshops. Partnering with Ken Nelson and Lesli Lang, founders of powerfulworkshops.com, in providing trainings and consultation on how to create and facilitate transformational workshops, with a heavy emphasis on mind-body practices and mindfulness. My workshop/training work has had many iterations -- in the Navy as a training department head, at Public Consulting Group as a training designer and deliverer of professional development to educators, and, most recently, co-leading workshops at Kripalu Center for Yoga & Health. This has helped me see how to usher people into a place of openness, where transformation happens at the mind, body, heart, and spirit levels. Enneagram Trainer. Earned certification in applying the Ennegram personality typology to leadership, management, and business consulting from Enneagram in Business founder Ginger Lapid-Bogda. The Enneagram has shown me two things. First, we all have our set, default ways of reacting to those things in life that make us uncomfortable (what I call "falling asleep"). Second, we all have a "super power," that, if lived into, is the unique thing that we contribute to the world. "Waking up" is the process of becoming aware of those patterns, in the moment, as they occur, so that we can live from a place of presence, wholeness, and readiness to give. U.S. Navy. Served active duty for six years. Led a company of 150 Seabees, responsible for construction projects in the U.S. and overseas. Served as training department head for a battalion of 500 Seabees (NMCB 5). Led a facilities maintenance division at Great Lakes Naval Training Center. Managed construction projects and civilian contractors on base in Guantanamo Bay, Cuba. Going into the Navy right out of college, I was thrown head-first into leadership. From managing multi-million dollar construction and maintenance projects to leading men and women in the business of preparing for war, I learned about leadership through trial and error. I learned that positional authority is assigned, but respect is earned. I learned that a true leader serves. And I discovered the incredible power available in a group of people who are aligned to a common purpose. 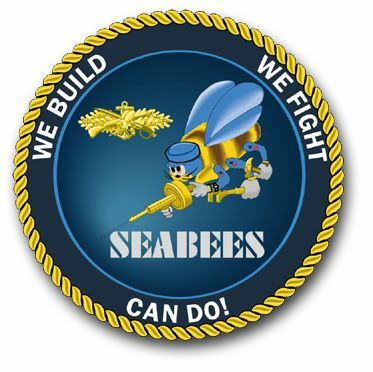 I share the Seabee motto (below) because it illustrates what can be born out of passion and commitment. Regardless of your view on the use of the military, it's hard to find anything but inspiration in these words and how they're embodied in the work the Seabees are doing around the world, every day, both in times of peace and in times of war. Whether it's building a tent city for refugees, a school in a remote village, or roads in a war zone, the men and women of the Seabees know what it means to give in service of others, often at great personal sacrifice. With willing hearts and skillful hands, the difficult we do at once. The impossible takes a bit longer. With compassion for others, we build, we fight for peace with freedom.